Yes, I had a game of Games Workshop’s Aeronautica Imperialis. It was Bob’s fault, naturally. Like the Epic. He was kind enough to let me win though, shooting down his six Ork contraptions for no loss among my noble Imperial übermensch. Well, that’s not entirely true. I fluked my “save on a 6” for the one fighter that was hit, and he flew one of his into the floor all on his own, so I didn’t shoot them all down. It’s a fun little game, and not a bad price. We had a fair game with just half a dozen models a side, so no vast investment required. Might have another go next week, and when I have a proper read of the rules I’ll comment in more detail. Have been tempted by this before, looking forward to a bigger review. Yep it´s a nice little game and I still need to get me some Manta and Thunderhawk. I’ve got some of the metal Epic Imperial planes somewhere so they’ll do to start with. I do like the Forge World ones though as they’re slightly bigger and have more space to do fun Ace colour schemes. Oh yes! And the Epic ones are not always in scale to each other depending when they were produced. AI are all to scale. I gots me a manta. It’s HUGE. I’d have thought it could fly slowly enough to not have to do that. In Epic, it fills the slot where other people get titans, rather than being aerospace and operating as a bomber. I don’t have the stats to hand to confirm or deny what I was told. It is a big model though. Hob big was the table? I’ve always liked plane games, and even wrote a dogfight game for 40K that was rather like this (though it didn’t use cards) when the Epic models were first released. It was never intended for publication, but I played it with some guys at one of the international White Dwarf meetings and around the studio. Dogfights was an idea that really should have been exploited long before it was. Look forward to playing some more. I was tempted by Aeronautical Imperialis a while back now. Had a few games with friends but never got anything because they didn’t have enough stuff / factions to pique my interest at the time. So I decided I’d wait it out and see if they did a Nid faction or some more stuff for some of the Xenos races… but they didn’t do anything else. Colour me a bit disappointed. I’d have thought it wouldn’t be too hard to do something with the Nids. Gargoyle swarms, Harridans, Harpies, and possibly Exocrines as ground flak. Use Epic models or models from other systems. I saw a Hordes Legion of Everblight Harrier used as one of the big two in an Epic army on the weekend, for instance. Not sure how the rules would fit, but I believe you can deploy Remoras from the Tigersharks in-game, so there should be some rules already in place for deploying small things from the larger fliers in-air. Well, actually I am a big sucker for Wings of War/Wings of Glory and still have all the publications and planes for Crimson Skies (even the ones that never got printed ;)). 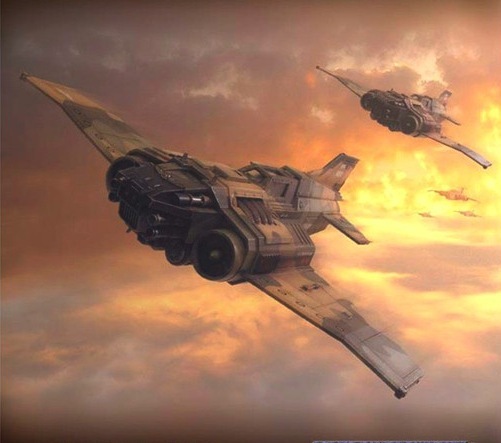 You might be delighted to hear that I am soon translating (And which will get released soon after the translation in all major languages) a game that includes dogfights in the SW universe in a similar way WoW runs the game. But you forgot the mother of all “trench-attacks”: Tora! Tora! Tora! I go back to playing Ace of Aces, if anyone recalls that. I keep meaning to see if I can find a copy as it was great for playing on the train or at the end of a session. In a way AI is like Wings of War, but a little bit more improved and slightly different when it comes to movement. I never got into WoW. Not sure why as I like the idea – just one of those games that passed me by. It’s probably because my regular opponents at the time weren’t likely to play it. AI doesn’t feel hugely groundbreaking mechanically, and that’s fair enough as it’s been done before and there’s no need to reinvent this particular wheel. AI uses a better system to WOW regarding speed and altitude, what i find silly about AI is that you select just the type of manouver, not if if your turn is left or right. This makes pre-planning very limited, and is far more important to move after the enemy than choosing the right card in advance. WOW is far more interesting in this field. Another aspect that i don’t like is the very low chance of hit.